Warm white beans tossed with a homemade lemon parmesan vinaigrette is a simple dish with flavors that bring back memories from my travels in Italy. White Beans / Lemon / Parmesan / Anchovies / Garlic / Olive Oil / Herbs…simple ingredients that season the beans so well that they almost outshine whatever you happen to serve them with. I have to thank my very best friend for introducing me to these delicious beans. She served them as a first course at a summer dinner party in Nantucket. Over the course of the years, I’ve tweaked the recipe depending on what I’m serving the beans with but most of the time I tend to serve them with chicken. I’ve pan sautéed chicken thighs and served them on a bed of the white beans along with oven roasted tomatoes. I have also served the beans as a warm salad with cherry tomatoes from our local market. 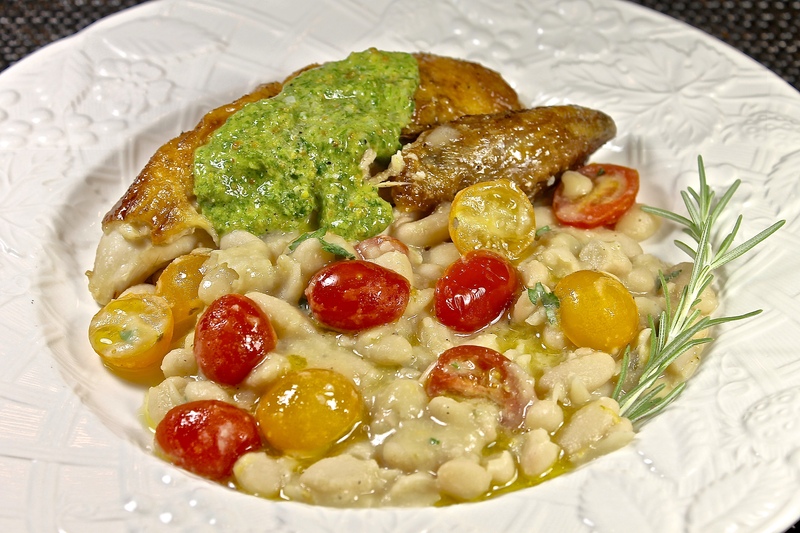 On a busy weeknight, the bean and tomato salad and a store bought rotisserie chicken topped with a quickly made fresh green herb sauce makes for quick and flavorful Tuscan inspired dinner. When you have time, you can create this dish using dried cannellini beans that you cook with fresh herbs much like a cook in Tuscany would do. I’ve included the recipe if that is what you prefer. If you are short on time as many of us are, you can use canned cannellini, great northern or whatever white beans you might have in your pantry. Either way you decide to prepare the beans, I think you will find them to be a delicious side dish. Makes about 1 cup of vinaigrette, adjust the recipe accordingly. grated zest of 1 lemon, about 1 tsp. In a small bowl, whisk together the lemon juice, zest, salt, pepper, mustard and anchovy until well blended. Slowly drizzle in the oil, whisking until emulsified then stir in the parmesan cheese. Taste and adjust for seasoning…it should be very flavorful. The vinaigrette can be made ahead and refrigerated up to a week. Bring to room temperature and whisk to recombine before using. Serves 4 – 6 as a side dish, adjust the recipe accordingly. Heat 1 Tbsp. oil in a large sauté pan then add the onion and cook until translucent. Add the garlic, rosemary and thyme then cook for another minute. Add the stock and cook for an additional minute. Add the beans to the pan and simmer until warmed through. Season with salt and pepper to taste. Ladle the beans into a large bowl. Pour the vinaigrette over the warm beans and gently fold until the beans are well coated. Let sit for a few minutes as the beans gradually absorb the vinaigrette. Toss several more times, being careful not to mash the beans when tossing. If the beans appear too dry, drizzle in a little extra olive oil. If you wish to make a warm bean salad, add the tomatoes and the basil or parsley and carefully mix together. Taste and adjust the seasonings, if necessary, and then serve. *Cooked White Beans: Place 1 cup of dried cannellini beans in large pot and cover with cold water by 3 to 4 inches (about 6 cups) and let soak overnight. Wash and drain beans. Place in a large pot and cover with water again by about an inch or two. Add a half onion and couple sprigs of rosemary, thyme and parsley tied together and bring to a boil. Reduce heat and simmer uncovered for an hour, stirring occasionally. Season the beans with salt and pepper to taste and continue to simmer until beans are tender, about 30 minutes to an hour longer. Add more water, if necessary, to keep beans covered with liquid. Cool beans in liquid for about 15 minutes then remove the onion and herbs. Using a slotted spoon, transfer the beans to a large bowl and keep warm. If you are not using the beans right away, reserve some of the cooking liquid in case the beans appear dry when continuing the recipe. The homemade vinaigrette is light yet very flavorful and is what gives the beans such a terrific taste. It is so good that you might want to double or triple the recipe and serve it on salads made with fresh ingredients from your seasonal vegetable garden or from your local farmer’s market. Pour what you are not immediately using for the bean recipe into a jar and refrigerate up to a week. For the best flavor, bring what you need to room temperature and whisk or shake to recombine. My girlfriend shared her recipe with me (which of course I’ve changed a little over the years) and now I’m sharing it with you. I hope you will enjoy the white beans with the homemade lemon parmesan vinaigrette as much as my husband and I do and perhaps you will end up sharing the recipe with one of your friends. This entry was posted in food, Home, lifestyle, photography, recipes and tagged bean recipe, cannellini beans, lemon parmesan vinaigrette, lemon parmesan white beans, tuscan recipe, warm white bean salad, white beans with lemon parmesan vinaigrette. Bookmark the permalink. Thank you Mandy, for your nice compliment. I’m really happy that you like the recipe. Hi Penny, I’m glad the recipe sounds good to you and appreciate your nice compliment. Yum! I love beans. My family on the other hand don’t have the same love for beans. Hi Carolyn, Perhaps dressing the beans with the vinaigrette will change the minds of your family. 🙂 If not, the nice thing about the recipe is that you can half it and make the dish with just one small can of beans just for yourself. What a delicious way to fix beans. Thank you Jovina, I thought you might like this recipe since it is inspired by dishes from Italy. Ooo, this looks delicious and I happen to be looking for a side dish now! Thanks for sharing! I’m always happy to share Inger. I hope you will enjoy the beans…they are a delicious side dish. We love beans as well so your white bean salad will work just fine. I love the looks of that Lemon Parmesan Vinaigrette and can see many uses for it. We’re fortunate here to get the Italian Bianchi di Spagna (bean) canned and dried. I think it’s like a butter bean but to me, they’re like big cannellini beans. I’ll be giving your recipe a try using these. Thanks for sharing. Hi Ron, I do think the lemon parmesan vinaigrette is a keeper, it certainly takes beans to another level. The Italian Bianchi di Spagna sound perfect for the recipe. Enjoy and thank you, I’m happy you like the recipe. We love beans! We often have them in soup or as part of a main dish, but they’re also good as a side or in a salad. And they’d go particularly well with this terrific looking vinaigrette. This would be dinner for us — loads of flavor and just enough to satisfy us. Thanks! Hi John, It sounds like we are the same. I always have canned and dried beans in my pantry and probably have a dozen or so recipes with them on the blog. The vinaigrette adds so much flavor to the beans, I hope you enjoy them. I love beans but don’t make them very often. Your vinaigrette looks great, I like the anchovies in it. I will try this recipe. I hope you will enjoy the recipe Gerlinde. The flavorful vinaigrette really adds great taste to the beans and is wonderful on salads. Thank you for your compliment. Yum, that looks delicious! Thanks for sharing Karen. I’m always happy to share my recipes Pam, I’m glad to know that you like the beans…thank you. What a wonderful dressing for the beans. Sounds delicious! Thank you Kay, The beans dressed with the vinaigrette really are delicious. It is also terrific on salads as well. White beans are so creamy and delicious. I love them even more than the kidney beans. That cheese vinaigrette is definitely the star. Bet it would be fantastic to toss with some homemade black lentils too. Hi Angie, We have similar tastes and I agree with you about white beans. The vinaigrette is a real keeper and you are right, it would be delicious with black lentils which I have in my party. Thank you for the idea. I am currently engaging in Weight Watchers Smart Points and this dish is approximately 1 – 2 smart points! Yay! I am saving and making this dish some night this week — the entire family will enjoy it! Thank you Darlene, I’m happy to know that you like the recipes. I made it a couple of days ago and it was yummy!! Thanks! Thanks for this. I adore white beans and yes, they are indeed a wonderful reminder of our time in Italy. I appreciate your using canned beans as I have terrible luck with dried beans. I never get that creamy texture even when I use spring water. i Angela, I’m happy to know that you like the Italian inspired bean recipe. While I do cook beans from scratch, more often than not, I use canned beans. They both work well in this recipe and the canned ones are a real time saver. I know I will love this Karen. What a pretty presentation. Love the flavors you have here! Thank you Ronit, the vinaigrette really does add lots of flavor to the white beans. That sounds absolutely delicious and I love white beans! Thank you Mad Dog, white beans are always in our pantry. White beans and lamb here tonight! For an ardent bean lover like myself yours is a lovely recipe. Love all white beans and your inclusion of anchovy fillets in the recipe . . . next time around shall follow your offering exactly. That said will always go to the trouble of making such dishes from dry beans. They provide 3-6 times the folate tinned beans too. Also I would not be happy putting BPA into my body nor making it cope with more salt in one helping than I should be having in all foods for the whole day . . . *smile* my way . . .
Hi Eha, I agree with you that there are lots of benefits to cooking dried beans and I do. There are many times though that canned beans come in handy when I have to get a meal on the table in a short period of time…I wouldn’t do without either in my pantry. I appreciate your compliment Sylvia, both for the white bean recipe as well as the dish. Do give white beans a try, I have a feeling once you do it won’t be the last. Cannellini beans are my favorite bean. I especially love them in salads. Your recipe sounds so lovely with the lemon, anchovies and fresh herbs. This is going on my “to make” list for sure! I’m with you about cannellini beans Valentina, they are very good. I hope you will enjoy the recipe if you get a chance to prepare it. Hi Sherry, I think I would like your version of white beans as a mash with the chicken as well. Thank you for your nice compliment. I’ve got a pantry full of dried beans and I need to think about using them in dishes like this. Not just soups stews or chiles. Looks delicious Karen. Hi Lea Ann, Yes I think you need to branch out with your use of beans although your stews and chiei recipes are always good. I love the sound of this, Karen – the brightness of the lemon with the dark, earthy beans sounds perfect! Thank you David, I’m glad you like the recipe, the lemon really does enhance the flavor of the beans…I think you would enjoy them. I really like this and have never used beans like this – we only have them in soup. Larry, my friend, you definitely need to start using beans in other ways than soup…not that there is anything wrong with soup. 🙂 I’ve got lots of bean soup recipes on this blog but I think this recipe is a winner. Mmm, love this. I will sneak the anchovies in on my husband (who loves Caesar and is clueless about what is in it) I got an Instant Pot for Christmas and have been playing around with it cooking beans. Gotta try this one..
You gave me a chuckle about your husband and anchovies. 😀 Believe me, he will never know they are in the white beans but will think they are very flavorful. Your Instant Pot will be put to good use with this recipe. Anchovies are best not discussed at my house. Cannelini beans are a favorite and I have not made any from dried. I’ll wait til I am feeling sneaky. I love white beans and know this has to be delicious! Just have to talk my husband into it somehow. Thanks! Hi Pam, Just make a small dish of the white beans, I bet he will enjoy them once he gives them a try. Hi Mae, Yes, white beans are great in salads and with tuna. I make an Italian white bean and tuna dip that is very good as well. I love all beans, and now that I cook most of them in my Instant Pot I make them all the time. I prepare white beans frequently, but this lemon parmesan vinaigrette is a totally fresh way for me to enjoy them. This recipe sounds absolutely fabulous, Karen. I’m delighted and thank you!! Hi Debra, the lemon parmesan vinaigrette takes the white beans from being good to being great. I’m glad you like the recipe, thank you as always for your lovely compliment. We love a white bean salad and especially during the summer months. Love the lemon and Parmesan vinaigrette! YUM! Hi Anna and Liz, I agree with you about white bean salads being so good in the summer. There is just so many variations that you can prepare and using the lemon parmesan vinaigrette is just one of them. Thank you for your nice compliment. Hi Sissi, Spring is on the way in your area and I know you will be getting your herbs out on your balcony. You can use some of them in this white bean recipe. Enjoy and thank you for your compliment. Never underestimate a simple bowl of beans! I love how you layered in all those flavorful herbs and seasonings. I would be so happy to just eat those on toast, nothing else needed. Thank you for your nice compliment Nancy. The lemon parmesan vinaigrette is a real keeper. Those white beans sound intriguing and they look delicious. Thank you Ladyfi, I’m glad you like the recipe for the white beans…it is easily adaptable. Hi Tandy, I agree with you, I have both canned and dried beans in my pantry but when time is a consideration, canned win hands down. The vinaigrette really adds to the flavor of the dish, I’m glad you like it. Hello Karen, we are loving this lemon parmesan vinaigrette. Deep flavors and so aromatic with just a handful of ingredients. That is what we love about Italian cuisine. A great dish during these transitional weather months is to have a warm salad. Delicious! Thank you for your lovely compliment Bobbi. You are right, a few ingredients can really add to the overall flavor of a simple dish like beans. I’m happy to know that you enjoy beans as much as we do Dawn. Yes, the lemon parmesan vinaigrette really does add loads of flavor to the beans…thank you for your nice compliment. Yum – it looks so delicious.. I am always on the lookout for new bean recipes. Hi Pam, Happy to be able to supply you with a new bean recipe, I hope you will like the dish as much as we do…thank you. What a fantastic recipe, Karen! The beans are such a hearty and delicious side. I love the use of anchovies as it imparts such great flavor. I would definitely make extra vinaigrette to use on other things. I appreciate your lovely compliment Thao. Yes, I’ve got some of the lemon parmesan vinaigrette in the fridge now, it is wonderful on so many things. 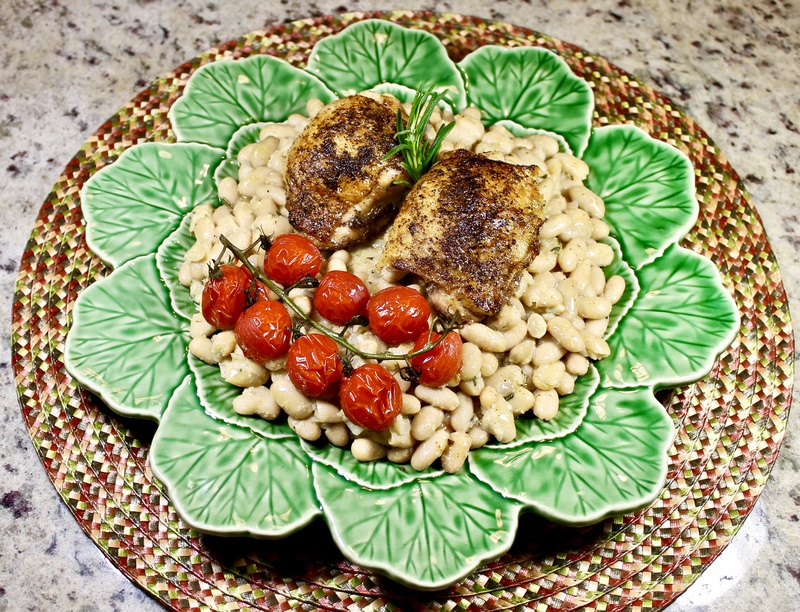 I can’t remember if I have ever combined white beans with chicken… The dish looks delicious, I should definitely try it! Hi Adina, White beans go very well with chicken, please do give it a try…I think you will like the combination. Oh Karen, this recipe looks absolutely delicious. It does bring up memories of the wonderful food in Italy for me too. We prepared a lot of chicken here and the beans are a healthy side to add. I’m definitely pinning and using this recipe. Great recipe for sharing! Thank you for your lovely compliment Emily, I’m happy to know that you not only like the white bean recipe but that it brought back memories of Italy as well. I appreciate your pin and hope that you will enjoy the dish. I have decided I’d like to eat with you every day as you fix just the kind of food I like. Your pimento cheese post had me drooling as that is one of my favorites. By the end of the day, I had some. I was just looking at a can of cannellini beans in my pantry the other day and thinking of doing an Italian style side dish with them. Making this recipe with some grilled chicken this weekend. Easy peasy! I’m glad I could provide you with a recipe for your cannellini beans Karrie. I do hope you liked the dish if you had a chance to prepare it. Thank you for your nice compliment. I had the best white beans of my life in Florence, Italy and this simple, delicious dish is making me so nostalgic! Looks and sounds wonderful, Karen! Oh yes Marissa, all over Tuscany you can find delicious bean dishes. I’m glad that my white bean recipe brought back memories of your time spent in Florence. Thank you for your nice compliment. Such a great comforting dish, Karen! There really is something comforting about a dish like this Denise, thank you. Perfect timing! My mom just dropped off some lemons from her tree. I love how simple this meal is and don’t you love how food reminds you of the people and places we’ve visited?! Perfect timing is right Sandra. Your fresh lemons will be perfect for this recipe. What a delicious and useful recipe. Thank you. I cook a lot of chicken, and I’ve never served it with beans. I think I’d love it. Thank you for your nice compliment Jeff. I’m glad you like the idea of white beans and chicken, I think they go very well together. I love cannelini beans and this recipe sounds yummy! Thank you Joanne, I’m happy to know that you like the recipe…cannellini beans are a favorite in our house as well. I’m happy that I could provide you with the recipe Juliana, I hope you will enjoy the white beans with the lemon parmesan vinaigrette as much as we do. Sometimes the simple things, like white beans, are the best. This is a great recipe. mmm. . . this recipe looks wonderful. I really appreciate the directions for cooking dried white beans. I never would have thought of cooking them with spices, but I’m guessing that it adds a wonderful nuanced flavor to the beans. Hi Sheryl, yes adding spices to the initial cooking of the white beans add lots of flavor then the lemon parmesan vinaigrette just enhances them more. I’m glad you like the recipe, thank you. Beans are so humble yet deceptively rich in flavor. I love them in dishes like this and so many more year-round. I feel the same way about bean dishes as you Carolyn, I’m glad you like the recipe. You are right Kathryn, the vinaigrette does give a real flavor pop to the beans. I love cannellini beans but never think of them as a side dish—always as a soup ingredient. The vinaigrette is fantastic sounding as well. Thanks for a great recipe idea! I’m happy that you like both beans as well as the vinaigrette Debra. Thank you for your compliment. Okay I did try Karen and it was delish! Those beans were just like little flavor sponges for the herbs. Thanks for sharing! Thank you Amy, I hope you will enjoy the white bean recipe if you get the chance to prepare it. Karen, such a wonderful dish. The beans look so delicious and that vinaigrette is everything! Love the anchovies in it. Hi Kelly, Thank you for stopping by for a visit and your lovely compliment. You are right about the vinaigrette, it is delicious. What a flavorful recipe and beans are such a nutritious staple. But these are really dressed up! Fresh herbs and minced garlic….I can almost taste them. You’re such a great cook Karen, thanks for sharing this great recipe. I appreciate your sweet compliment Allie, thank you. I’m glad you like the recipe,the white beans have layers of flavor from the initial cooking and from the vinaigrette thats added afterwards. Wow, the flavors in this dish sound phenomenal! Just like in Italy!! Thank you Liz, the white beans are indeed very flavorful. Karen, it’s the dressing on this lovely dish that excites me! You’re so right, it’s just like in Italy, and I can’t wait to make this. Also love those cherry tomatoes, perfect in a legume dish! Thanks for the inspiration! Hi Laura, You are right to like the lemon parmesan dressing, it made a real star out of the beans. It is definitely worth making a large portion and keeping it in the fridge. I appreciate your nice compliment, thank you. Karen, what a lovely recipe. I am going to make this this summer. 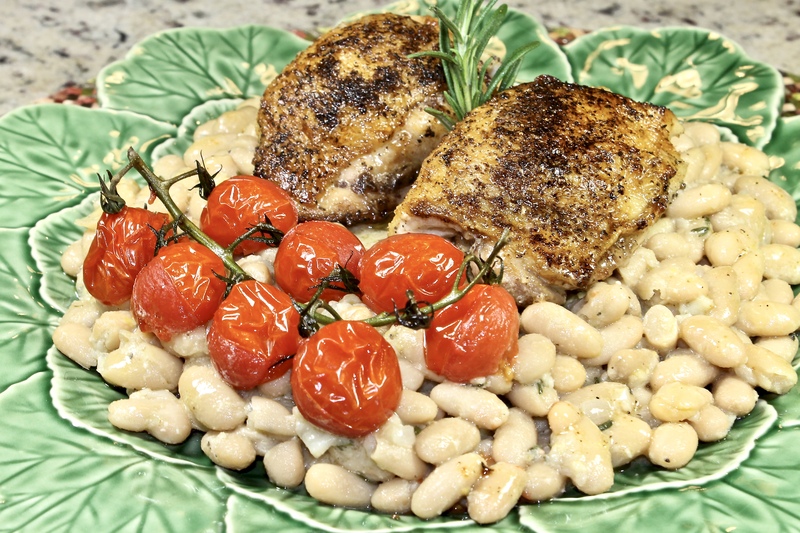 Grilled chicken is a favorite and your beans and tomatoes are perfect. Thank you for sharing. Also thank you for your healing thoughts. I happy you like the recipe and plan to make it in the future, thank you. I hope you get well soon Linda. I had phenomena last summer and know how long it can take to get back to normal. You are in my thoughts. I love lemon parmesan vinaigrette but I’ve never thought to add anchovies. Clearly, I’ve been missing out!!! As a dressing for the beans it sounds divine. Have some leftover grilled chicken that I think would be perfect with this!!! Hi Nancy, Do try adding anchovies to your next batch of lemon parmesan vinaigrette, I believe you will enjoy it. Adding some of the dressing to the white beans adds lots of flavor, I’m glad you like the idea. Yes! I love using white beans as a base for all sorts of recipes. I often forget how tasty they are by themselves, though. Definitely need to make this one! And isn’t it fun when recipes remind us of our travels? That’s one of my favorite things about cooking! I agree with you David, part of the pleasure of traveling is being able to come home and recreate foods we have enjoyed. Each time we have them, that bring back wonderful memories. I think you would enjoy the white beans dressed with the vinaigrette and appreciate your compliment. I always keep canned, white beans in the pantry. They are such a wonderful staple to keep on hand. This simple and delicious savory recipe is something I’ll try! I agree with you Deb, I always have a variety of beans in my pantry. I hope you enjoy the recipe if you get a chance to prepare the white beans. Thank you! Karen, this is so right up my alley! I have made white beans with just a little lemon for a side but never gave any thoughts to go further with that concept! I’ll be making this! YUM!! Thank you Mollie, I do hope you will enjoy the white beans…the vinaigrette really adds so much to the overall flavor. White beans are one of my favourites, so creamy. The dressing sounds like it really gives the beans a punch of flavour. What a nice, quick dish. Thank you Eva, for your nice compliment. The beans are indeed creamy and delicious. I’d like to thank your friend for kindly sharing this delicious recipe with you Karen, but also to you for your ingenious ways of tweaking and improving recipes! What a perfect meal for Lent for my family! And also wanted to comment on your beautiful green leafy platter which I share a love for as well! Thank you for sharing this delightful recipe! Hi Roz, I have indeed let my friend know that she was the inspiration for this recipe. I appreciate your very kind words, thank you so much. Enjoy the beans if you get a chance to prepare them during this Lenten season. This recipe and the photos are just a big YES for me! I try to cut carbs but I always think…on a cheat day I would have grains, beans, and anything with noodles. Still, I can add a small handful of any of these things to salads, soups, stews–so many options which aren’t going to set me back. I love this recipe as I can see how all of these ingredients come happily together at the end. I’m thinking a firm white fish would be delicious, too, with the lemon and textures. Karen, These look amazing!! I love love beans – although I don’t often eat white beans. Definitely a must try! Hi Haylie, Thank you for stopping by for a visit and your nice compliment. I hope you will enjoy the white beans if you get a chance to prepare the recipe. Love this appreciation for such a classic dish – beautiful, Karen! I appreciate your compliment Ksenia, I’m glad you like the white bean recipe…thank you! It sounds strange but I’m a little obsessed with beans and love their wholesomeness and texture! You’ve inspired me to cook one now that the weather has cooled off. I don’t find you strange at all Lorraine, I happen to agree with you about beans. 😀 I’m happy you like the white bean recipe. Enjoy! Love this. I always have white beans on hand. They’re especially handy after a trip and you have no fresh groceries! They’re really good with good canned tuna also! Thank you Mimi, I’m glad you like the white bean recipe. You are so right, I always have beans on hand for a “pantry dinner” when fresh ingredients are lacking. Especially when you arrive home from a trip to an almost bare refrigerator. The vinaigrette and salad sound so wonderfully flavorful with the herbs, cheese, and anchovies! Thank you Laura, it truly is a flavor salad…I’m glad you like both recipes. Make a big batch of this on a weekend and enjoy it all week long. So great alongside so many dishes. Or even as a nice little lunch at home. You are so right Carolyn, this really is a dish that you can use for meals all during the week. I’m glad you like the white bean recipe, thank you.